Bears Qb Jay Cutler throws to his favorite target Brandon Marshall. It’s not the regular season, but Bears fans have been clamoring for game action, and tomorrow the first preseason game will give them a taste. Denver will be here, and the Broncos will garner plenty of attention as it will be the first time in over a year that quarterback Peyton Manning returns to action with a new team. However, don’t expect to see him get much playing time (if he gets any at all). After mini camps, OTAs and a few weeks of training camp, finally the Bears will show some of their starting units even if it is just a glimpse. You will see Jay Cutler and Brandon Marshall get on the field, and they most certainly will be the crowd pleaser. Maybe Lance Briggs and Julius Peppers will play a bit, but Brian Urlacher is not expected to play, he’s still recovering from his knee injury and has missed several practices. It seems the offensive line starting unit is almost set at left tackle. J’Marcus Webb appears to have a hold of that spot. Webb has had issues jumping offside and it will be imperative for him to correct that problem, or he will be watching from the sidelines. Chris Williams, a former first round draft pick, has worked out at both tackles and appears to be the back-up at tackle. Right tackle Gabe Carimi is coming off knee surgery and has been eased back into the lineup. 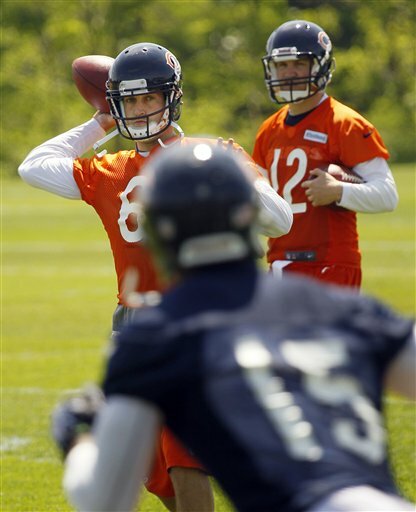 Even if it is a very brief appearance, the connection and chemistry of Cutler to Marshall has been the talk of Bears training practices with plenty of oohs and ahs from the Bourbonnais crowds. It has been decades since Bear fans have seen the caliber of a player like Pro-Bowler Marshall at that position. Remember Johnny Morris or Harlon Hill? Yes, it’s been a while. Keep an eye on rookie receiver Alshon Jeffrey; he has worked with the starting unit when Devin Hester has been sidelined at times. Running back Matt Forte will also have limited time on the field; even without the earlier practices he has looked good at camp. Newly acquired Michael Bush and Kahlil Bell will get carries. Bush will be instrumental in goal-to-goal situations. Also, the tight ends Kellen Davis, Matt Spaeth and rookie Evan Rodriquez will be visible on the field, former offensive coordinator Mike Martz didn’t like using that position. Rodriquez was a 4th-round draft pick from Temple and may have a more versatile role as the “H”-back seeing time in the backfield and at tight end. Here is one thought that may put smiles on the faces of Bears fans, a real honest-to-goodness backup quarterback in Jason Campbell. Oh by the way, one of Denver&apos;s backup quarterbacks is Caleb Haney, who may endure some booing when he takes snaps under center. When #99 walks onto the field there will be no reminders of Dan Hampton (the most renowned player to wear that number). Top draft pick Shea McClellin is fast but certainly not as big as Hampton. The only comparison is the position — defensive end. The former Boise State defender has had some issues at the start of camp but is making steady and slow progress. It is a whirl-wind to move from college to the speed of NFL. Another player that is fighting for playing time is former Northwestern star Corey Wooten. He is finally healthy and if he can rush the passer he may find a spot in the defensive line rotation. Second-year defensive tackle Stephen Paea may have already secured a spot in the rotation, he has been practicing with the starting unit. Since the Bears starting defensive unit it starting to show its wear and tear from aging, it will be important to infuse younger players into the mixc. What continues to be on most people’s minds on the defense is the secondary. For them camp has been a very competitive experience, lining up and going against Brandon Marshall. It has been interesting to watch how frustrating it must be for the Bears defense but helpful for match-ups against teams with receivers like him. Pro-Bowler Charles Tillman is secure at one corner, it seems Tim Jennings may have the other, but there will be competition there. The safeties seem to be set with Major Wright and Chris Conte. Rookie Brian Harden is being converted from a cornerback to free safety. His height at 6’3,” is considered a plus. Free agent pick up Eric Weems should be seeing some action on returns. McClellin is expected to contribute on special teams. This unit is one of the strongest in the NFL, coach Dave Toub has personnel turnover every year and yet manages to make it work. Over the weekend Bears receiver Devin Thomas unexpectedly retired, he was supposed to bolster this unit. The team re-signed veteran Rashid Davis on Monday. The Olympics may be stealing the sports viewers across the world, but when it comes to the Bears, even a preseason game will have the fans’ attention.